A man was shot dead in a cemetery after meeting a former friend to resolve their "bad blood", a court has heard. 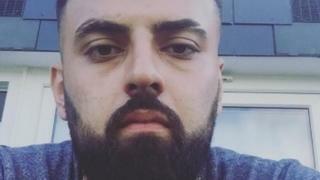 Ismail Tanrikulu, 22, shouted "you think it's me" before he was shot in Tottenham Cemetery, north London, on the morning of 3 September last year, jurors at the Old Bailey were told. A bullet passed through his arm and into his abdomen, causing fatal internal injuries. Musa Duru, 21, of Great Cambridge Road, Tottenham, denies murder. Prosecutor Julian Evans said Mr Tanrikulu and the defendant had spoken on the phone and arranged to meet at the cemetery to "amicably" resolve a falling out. "Ismail Tanrikulu and Musa Duru were well known to one another and... it appeared they had been on friendly terms," Mr Evans said. "However, by that morning it would appear there had been some sort of falling out between the two of them." Mr Evans said Mr Tanrikulu "hoped no doubt to sort out the issue between them amicably". Mr Tanrikulu arrived at the graveyard with his cousin, who parked up and waited outside in his Audi. The witness allegedly heard his cousin shout "you think it's me" moments before two loud bangs. He reversed his car for a better view and saw Mr Tanrikulu lying on the ground, with his head down and holding his side, the court heard. Mr Duru was allegedly accompanied by a second man who was seen on CCTV carrying a "man bag" over his shoulder as they entered the cemetery. The man held up the bag and pointed it towards Mr Tanrikulu's cousin, prompting him to drive off, the prosecutor said. Mr Evans said: "The bad blood that did exist was between Mr Tanrikulu and this defendant Mr Duru." Mr Duru's defence would claim the victim had stolen some cannabis, was aggressive towards him at the cemetery and there was a scuffle when the second man stepped in, the prosecutor said. Mr Duru claimed he was walking away when he heard the shot and was later told it was Mr Tanrikulu's gun. But Mr Evans said Mr Duru and the second man had acted together "as a team" and had armed themselves. The second man, who cannot be named for legal reasons, fled to Turkey within days of the shooting, jurors heard.